The number of speakers who faced opposition or disinvitation this year reached a record high, according to a report from the Foundation for Individual Rights in Education. FIRE, which has been tracking the number of incidents involving campus speakers since 2000, found that in 2016, at least 42 separate incidents occurred—double the number that occurred in 2015. That represents a 24 percent increase in the number of incidents compared to 2013, the last record-setting year. In 2013, there were 34 incidents. Eleven of the 42 incidents pertained to a single speaker: Breitbart’s Milo Yiannopoulos. Yiannopoulos has been the target of protests and has had to cancel some talks due to security concerns. Other conservative speakers, such as The Daily Wire’s Ben Shapiro, also faced dangerous protests. FIRE noted that commencement speakers used to make up the bulk of incidents. This year, former House Speaker John Boehner and Vice President Joe Biden each faced backlash at the University of Notre Dame. Former Secretary of State Madeleine Albright ran into trouble at Scripps College. One of the highest-profile disinvitations in 2016 was journalist Jason Riley, who was disinvited from Virginia Tech. But the oddest disinvitation was John Derbyshire, who was disinvited by Williams College President Adam Falk due to fears his speech would be offensive to black students. Ironically, Derbyshire was invited by a black student, Zach Wood, who heads up the “Uncomfortable Learning” series that brings controversial speakers to campus. Ari Cohn, FIRE’s director of the Individual Rights Defense Program, posted a statement to the website about this year’s disinvitations. “The resurgence of disinvitation attempts following a year of decline in their prevalence is a disturbing development,” he wrote. Right-leaning speakers made up the majority of disinvitations and incidents, with 35 of the incidents caused by left-leaning students. 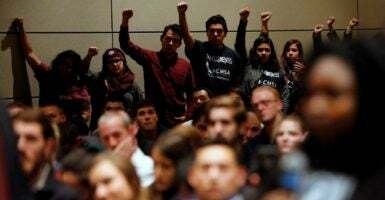 The activity follows a recent pattern of leftist students calling for “safe spaces” and “trigger warnings” while attempting to shut down anyone they disagree with by calling them racists or sexists.